We’re at it again, PAYDAY crew! 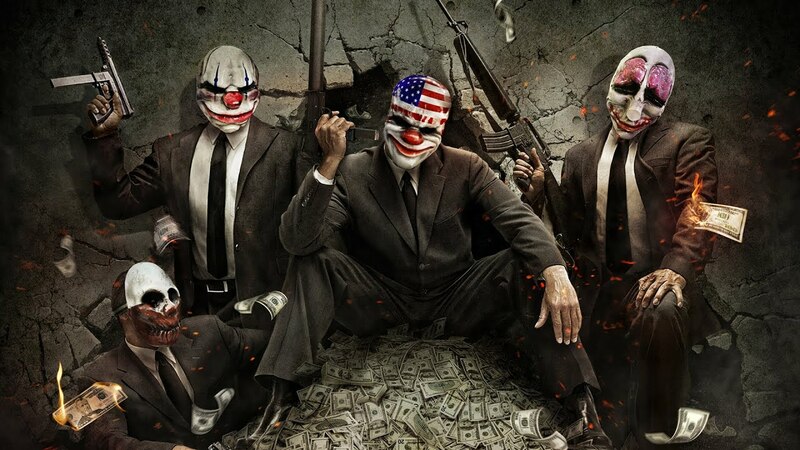 The criminal masterminds behind the highly anticipated PSN co-op shooter PAYDAY: The Heist, are coming for your PS3s next Tuesday, October 18th! SOE and the OVERKILL team have worked diligently to develop and create a game with the highest quality of content – which will give players continued replayabilty and hours of complex, death-defying heists in a never-ending pursuit of the next big score. We can’t wait for the launch of this highly anticipated game and are even more excited for players and fans to finally enjoy PAYDAY The Heist together online. Once again, SOE would like to thank the loyal community for your patience and assure you that this will be worth the wait! In the meantime, feel free to check out the all-new Slaughterhouse trailer above that highlights one of the most difficult heists featured in the game. Check out the PAYDAY: The Heist website for more info. Thanks again for your continued support! Gear up to seize the game on October 18th. Will it come on regular psn update(19.october) ? We have still yet to finalize that OFFICIAL release date for Europe. It will not be too much longer after 10/18, however it will not be released in EU on 10/19. The EU product, due to the amount of localized text for French, German, Italian and Spanish is requiring just a bit longer. Thank you for your patience and continued support. If we pre-ordered this, do we automatically have it in our download history? Do we receive a message via PSN or an e-mail with a code? Or do we just go download it like a regular game? Hi, all pre-order customers will receive a XMB message that will display a FREE product for download. Simply go through the XMB and download your copy of PAYDAY that you pre-ordered and paid for. If you enter the store directly without going through the XMB then you will see a FREE SKU of PAYDAY. Again, simply download your copy of PAYDAY that you pre-ordered and paid for and start enjoying the ACTION!!! Thank you for your support and continued patience. We hope you will very much enjoy this dynamic, action-packed gaming experience. I am very excited to play this game next week! The wait is almost over and i look forward to see how the game turned out! Awesome, great to hear!! We’ve thoroughly enjoyed working on this game with the developer OVERKILL and helping to bring it to market for our anxious customers. We are confident that you find the action and gameplay a truly unique experience that can be enjoyed many times over with your friends as you try to complete six incredible heists. Enjoy the game and thanks again for your loyal support and continued patience. I’ll believe you when it’s on the store. I would rather get a refund and give the $20 to a homeless man than you pricks. It was supposed to be confirmed to come out October 4th too. Look what happened. After this I will never buy a product from this company. They are horrible as will the game. So up yours overkill by releasing crappy games, and delaying at last minute. What a joke this company is. Well, I am sorry for your frustration due to our last minute delay. It was very unfortunate, however we are committed to delivering games with outstanding quality that are free of technical issues and bugs. This decision was necessary due to a last minute issue that was corrected and fixed. The developer (OVERKILL) has worked tirelessly for the past 4 months to delivery a totally unique PS3 game filled with action-packed heists and exciting, cooperative, online gameplay that is sure to test even the best FPS player around. We hope that you reserve your future judgment once you’ve checked out PAYDAY and experienced it for the first time. I’ll challenge any FPS fan to NOT find this game FUN and ENTERTAINING. well i’ll be pretty consumed with Batman, but at least you managed to get it launched before battlefield, because now i’ll at least use it for the multiplayer aspect with my girlfriend until battlefield comes out. @5 I assume you won’t be buying Twisted Metal, and your whole comment was so unprofessional that I hope they remove it as spam. @7 LOL go away kid. Get a job. Next Tuesday, the 18th, really? Another co-op game on the PSN the same day as Dungeon Defenders and Okabu, and R&C:A4O in stores. And the same day Batman comes out? Whoever’s in charge of game release dates at Sony somebody should buy them a calendar. Not to say too many games for us is bad, but I wouldn’t want to be a developer among that crowd, the last few weeks have seemed pretty light. Hmm same day as R&C: All 4 One and Batman. Then the next week BF3, then the next week UC3, NOTHING GOOD comes on Nov. 8 so that’s good lol, then AC: Revelations the week after. Ugh when am I supposed to play these games? I think you’ll find PAYDAY will stand up nicely in that crowd and probably earn your respect after a few game play sessions. Hopefully you’ll find time to try out all six heists and perfect your FPS skills and tactical heists skills for OVERKILL mode. A true test for anyone. Enjoy all the great games coming out and thank you for your support and continued patience for the debut of PAYDAY on the PSN! fumbled the ball once again, lol..
but hey whats new. batman will consume me til b3 and then its open season 4 the rest of the games flooding in. i agree w comment @5.
hows this, please keep our network secure 4 multiplayer because w/ the release of b3/mw3 and many others releasing soon, it would be a tragedy, to say the least, if we encounter another lockdown. and this game being a replay value 4 multiplayer gaming, this would also fall into the list of games. 4 me i will buy this in mid dec. if there are some high grades 4 this game then i may consider downloading sooner, but atm i will keep this game on the backburner, just as the pre-order funds are. hope who ever pre-ordered this gets a great gaming exp 4 the troubles, if not its yet another bait and catch which is is very souring to our gaming palates as well as intelligence. Thank you for your comment. The game shines when played with your friends in 4 player coop multi-player mode. The unfortunate, last-minute delay was necessary due to a technical issue that popped up at the 11th hour. It is our goal and commitment to provide high-quality games that are free of technical issues and bugs. That commitment to you will be once again put forth with PAYDAY when we launch in NA or Tuesday, 10/18. We hope you check out the game and awesome gameplay. We’ve got a FREE demo of the World Bank heist going out with the launch of the complete game. Check it out this Tuesday! Thank you for your continued support and patience. It would be nice if you’d specify again if it supports local co-op or not. Hi, thank you for your support. We are confident that you’ll find PAYDAY to be an instant great and something you’ll definitely be glad you have as part of your library. Especially at $19.99!! How can you beat that? Running and gunning through six high-intensity heists with your friends will be like something you’ve never experienced before. We only hope that you find time to fit Batman in between your attempts at heisting some of the best scores in town. ;-) Anyway, thank you for your support and continued patience. Enjoy the game!! Glad it’s the 18th… have Batman AC coming that day too. Payday will be a nice break from long stretches of AC. Doesn’t GT5 DLC come out that day too? Gonna get busy. I wish publishers/developers would release some of this stuff during the boring summer months instead of releasing everything in Oct/Nov during midterms. Can’t wait for this to finally hit, I’ve been so curious about it. Also, it’s interesting to see how people have never seen a game get delayed before. Hi, thanks for your support. PAYDAY will surely not disappoint. The delay was unfortunate, but necessary, and we’re all good now. Now that’s out of the way we can focus on your feedback and enjoyment of the game. Plus, we’re hard at work on a DLC pack for the many PAYDAY fans. We’ll be adding two new heists and some other special treats. Thank you again for your continued patience and support. We are confident that you’ll find PAYDAY well worth the wait and money. Enjoy the game! Thank you for your comment. The delay was necessary due to last minute technical issues that needed to be fixed and resolved. The community support has been tremendous and our delay was in no way centered around the need to build a bigger sense of community. The delay, again, was due to a last minute issue that needed to be fixed. It was very unfortunate, but our commitment to quality and game experiences free of technical issues and bugs are top priorities. We are confident you will find PAYDAY truly fun, entertaining and packed full of action that you and your friends can enjoy. Thank you again for your continued support and patience. But at least, since Sony did take the time to send me a message in the beginning about the voucher, I’d have thought, at least my perception of common sense tells me, they’d have the decency to do the same in message about the delay. You know– keep a paying/paid customer, that has already invested in a product(s) informed of their purchase. The original message was a great step at that, but the follow up just wasn’t there. And that’s just not good business imho. Anyways, that’s my Canadian two-cents. Can’t wait for this game! Just need to make my friends buy it so we can rule the world with our guns and money!!!! And i can see this game bringing some really nice DLC, i mean there are alot of amazing Hiests out there to be redesigned and put into this game!!! Great to hear. You and your friends will enjoy hours and hours of fun and FPS intensity as you try to take on six of the toughest heists in town. But, each time will be different as the Authorities respond to your revised tactics. Go in running and gunning and they are going to bring the house. Corner up at key points and they will tactically smoke you out. It is every-changing and ever-challenging. And, then once you’ve mastered Normal and Hard modes try your hand at OVERKILL. A true test for any FPS gamer. Enjoy the game and thank you for your support and continued patience! Man, I’ve been cheerleading the hell out of this game since I got a chance to try it at E3. Now it comes out the same day as Arkham City. Bummer. You’ve got my money, but forgive me for ignoring it for a week or two. Because, hey, Batman. No worries. ;-) Thank you for your support and continued patience. We are glad you got an opportunity to check it out at this year’s E3. We’ve added so much since then and really polished up the fine details for the final product. We are confident this game will be a truly outstanding experience for you and your friends. And hopefully, you’ll find time to play a little Batman in between your PAYDAY sessions! Again, thank you for your support and enjoy the game. Just so long as those who purchased the four PLAY titles get sent their message before it comes out. Since no one asked how much it will cost im guessing you all already know…..so can someone tell me. Ooooh! I hope this game doesn’t get lost in the shuffle of multiple retail games that are coming out this year! An October release date is probably not the best time to release this game! If I preordered this the last week of Sept, does this still count towards the spend $60 for $10 back since it doesn’t release until October? People act so irrational over a couple weeks delay. Calm down people. They are just games and we all know you will buy more from Sony in the future. If a games absence from your life sends you into this angry of a mood perhaps you need psychological help? Not a problem, I usually like to take breaks from games and hop onto another one, and Payday will be perfect for that… Saving the city as the dark knight…. Then pulling off a major heist as masked men with some friends. Now please, for all our sakes, at least give us 2 days notice before you think of delaying it again. That last minute delay really shocked a lot of us. @41 According to my sources at Sony, that was a funny attempt at trolling. @14 Twisted Metal was also delayed, though not so close to launch. Obviously trashtalker cannot comprehend that they delayed it for a good reason. But ya know -_-..
@ jpbslayer – oh man I read the comments on the forum and I hope that was not delayed…anyway this is a must buy and I cant wait. whoever is whining about the delay, give sony a break man , better for them to fix the bugs then to give us crap. this game looks amazing. and in this economic crisis its gonna be fun to stick it to the man in this virtual bank hiest game…LOL!! !